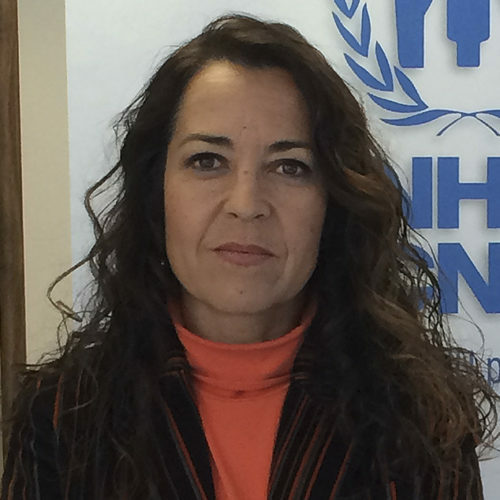 María Jesús Vega is currently spokesperson for UNHCR in Spain and responsible for the Communications Department of the Office of the United Nations High Commissioner for Refugees in the country. She studied Social Work at the Complutense University of Madrid and broadened her studies with a Fulbright grant in USA. Vega has been for 25 years developing her professional career in the refugee field starting her work with the Red Cross, the International Rescue Committee and UNHCR. Within the UN Refugee Agency she has work in the field of protection, political incidence, family reunification, unaccompanied and separated minors, resettlement, repatriation and donor relations. She has become familiar with UNHCR operations in countries such as Colombia, Democratic Republic of Congo, Kenya, Ethiopia, Tunisia or Jordan and Central America. She is part of the Emergency Team of the UN Refugee Agency. Three years after the appalling images of bodies floating in the Mediterranean and boats reaching the Greek Islands with tens of thousands of refugees and immigrants, arrivals in Europe have considerably reduced but not so the number of men, women and children who continue to drown daily attempting to reach the continent. In spite of this, in Europe we see with apprehension a reduction in the area of protection, more restrictive legislative changes towards people fleeing from war and persecution and a growing political discourse that instils fear, distrust and hate towards the “Others” when the priority of politicians should be to encourage and strengthen coexistence and a favourable environment to welcome and integrate those persons, not present them as a threat. With concern we see how these crises are deteriorating the capacity and moral authority of States in defending Human Rights and how policies lean towards approaches that are exclusively to do with border control and security. While in Europe the debate focuses on who accepts the least number of refugees, worldwide for the 5th year running we have reached a new record of forcibly displaced persons, exceeding 68.5 million. 85% of refugees are being hosted in disadvantaged or developing countries. The World Compact of Refugees which will be adopted at the end of 2018 and which will be a historic milestone, will offer States a new opportunity to respond to situations of refugees in a more equitable, efficient and predictable way, involving multiple agents.